It appears that, while the news cycle is dominated by the launch of Overture, the first chapter of Battlefield 5’s Tides of War, EA DICE has launched a new Battlefield 5 sale. The sale is only available via online store platforms, and only available to some gamers. However, the sale price is offering a massive 50% price reduction. 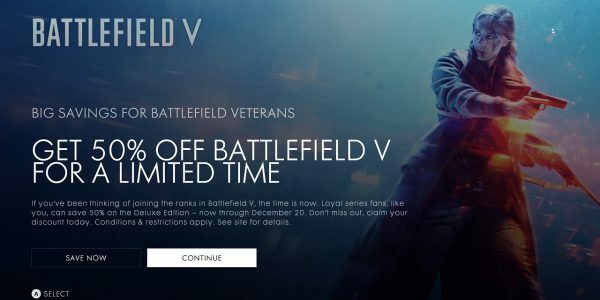 The new Battlefield 5 sale is specifically targeting fans of the Battlefield series rather than new players. What that means is that you need to already own a copy of Battlefield 1, Battlefield 4, or Battlefield Hardline in order to take advantage of the discount. The sale is available through the in-game stores of all three of these older Battlefield games. Note that the sale is also only for the more expensive Deluxe Edition of the game, not the standard edition. 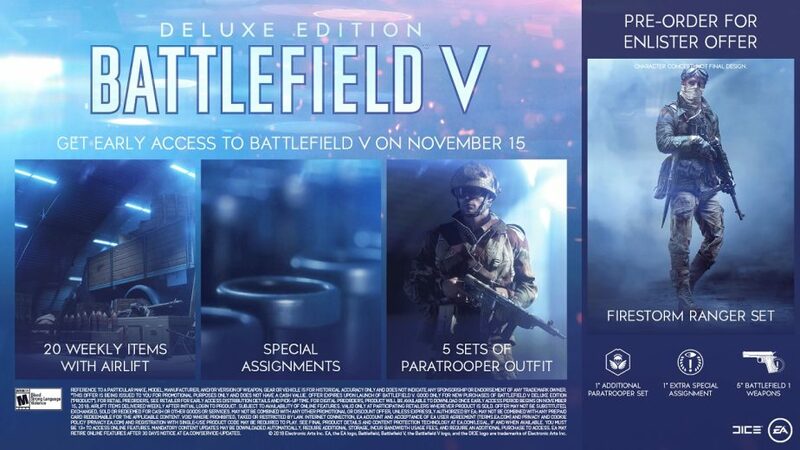 The Deluxe Edition comes with 5 sets of in-game Paratrooper Outfits, as well as bonus Special Assignments and 20 Weekly Airlift Items. If you’re unaware of how the Battlefield 5 post-launch content is working; things are a little different to previous titles. There’s no season pass, and the Deluxe Edition doesn’t give any special access to upcoming DLC. 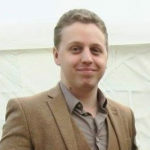 Instead, all post-launch content for the game will be free for all players. As such, you don’t need to worry about anything like that when deciding which version to go for. The first of these new content releases launched today; chapter 1 of the Tides of War post-launch content schedule. It includes a new single-player story mission, a new game mode, new map, and new vehicle customisation options. It also launched alongside a major balancing update and patch.